Pepperoni, or Pepperoni Sausage, is a popular type of salami, and Italian fermented sausage. It usually consists of pork, beef, and spices, and is commonly used as a pizza topping and as a snack. Characteristically, Pepperoni is quite smooth and bright red. Pepperoni is used as a filling in the Pepperoni Roll. 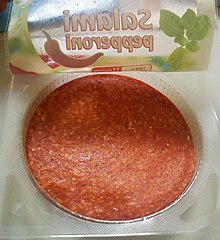 Pepperoni is sometimes used as a choice for submarine sandwiches. The Italian word, "peperoni", means sweet bell peppers or capsicums.